In today's Financial Times, an article by Jeffrey Sachs presents all kinds of arguments to conclude that Keynesian economists have been wrong during the crisis, that fiscal and monetary policy tools have not worked and that the US and other advanced economies need a different kind of policy (education, infrastructure,...). The issues raised are complex and there will always be a debate on the mix of economic policies that are right to help growth in a given circumstance. But the article does two things which are difficult to justify: first it reaches conclusions about what we have learned without citing any proper empirical evidence (the "it is so obvious" syndrome). And, second, it presents arguments which are inconsistent. Let me take on both of these issues separately. "We can’t know how successful (or otherwise) these policies have been because of the lack of convincing counterfactuals." "We should have serious doubts. The promised jobs recovery has not arrived. Growth has remained sluggish. The US debt-GDP ratio has almost doubled from about 36 per cent in 2007 to 72 per cent this year." Is that a test? Is this the counterfactual that was so difficult to build? That was easy! "The crisis in southern Europe is often claimed by Keynesians to be the consequence of fiscal austerity, yet its primary cause is the countries’ and eurozone’s unresolved banking crises." I wonder what type of counterfactual he built to reach this conclusion. "the eurozone crisis, declining North Sea oil and the inevitable contraction of the banking sector"
That was another quick conclusion to reach. Let me move now to the second point I wanted to make, one of inconsistencies in the logic used. The article criticizes monetary policy for ignoring the risk that current low interest rates might be creating another bubble. Here is what I find interesting: the only mainstream models that I know where monetary policy can affect real interest rates are Keynesian models (the ones he is criticizing). It is only in models where prices are sticky that you have the central bank, who sets the nominal interest rate, having an effect on the real interest rate and economic activity. But even in these models, this effect is transitory. As soon as prices adjust, real interest rate go back to equilibrium, out of control of the central bank. The narrative that suggests that the Federal Reserve is responsible for low interest rates since 2003 is not supported by any economic model I know. The drift in real interest rates that we have witnessed for more than 10 years has to be more fundamental than a switch to expansionary monetary policy. And nothing more fundamental than supply and demand which in this market is represented by world saving and investment. It is well documented that there has been a significant shift in global saving during the last decade. One that justifies the global imbalances that we have witnessed and also the fact that global interest rates have decreased. And after 2008 a global crisis that resulted in yet another increase in the supply (saving) and a decrease in demand (investment) has brought these rates to even lower levels. Central banks are not responsible for this trend. And if you do not believe in Keynesian models they cannot be even responsible for the small movements around the trend. Economists will never agree on everything and the excuse we (economists) have is that it is impossible to build empirical tests that definitely prove or disprove alternative theories. But we can do better than this article. We can at least build on a set of knowledge that is commonly accepted rather than reopening the debate starting from zero whenever we want to make a clever or controversial point. One of the first concepts taught in any macroeconomics course is the identity that links the financial balance of the private sector, the financial balance of the government and the current account (which is the financial balance of the country as whole). In a closed economy the financial balance of the private sector has to be equal in size to the financial balance of the government but with the opposite sign. I find this identity very powerful when I teach my students as it links concepts that are normally seen as independent by those who have never studied macroeconomics before. The identity is also a great source of confusion when it is used in a dynamic setting, to understand growth. For example, there are those who wrongly claim that this identity shows that government deficits cannot create growth because by definition the private sector would be saving every dollar that the government spends. This is wrong. "...every dollar of government deficits has to be offset with private sector surpluses purely from an accounting standpoint, because one sector’s income is another sector’s spending, so it all has to add up to zero." This is only correct if we assume that the economy is closed, but that's not the point I want to make. "That’s the starting point. It’s a truism, basically. Where it goes from being a truism and an accounting identity to an economic relationship is once you recognize that cyclical impulses to the economy depend on desired changes in these sector's financial balances. If the business sector is basically trying to reduce its financial surplus at a more rapid pace than the government is trying to reduce its deficit then you’re getting a net positive impulse to spending which then translates into stronger, higher, more income, and ultimately feeds back into spending." This paragraph is misleading (I will ignore again the fact that in an open economy things are more complex). It states (at least this is the way I read it) that growth depends on the "desired changes in these sector's financial balance". This is not correct. I can imagine an economy where those financial balances are not changing at all where output is growing very fast (and I can also imagine another one where output is collapsing). There is no connection between growth and these financial imbalances. As long as demand (private or public) is feeding into production and income, the private or public sector might be spending more than last year but their income is also increasing which can make the financial balance remain at the same level as before. If we believe that we are in a situation where the output gap is large, there are unused resources and, as a result, output is determined by demand, what matters for growth is whether demand increases relative to last year and not so much the change in the desired changes in the financial balances of either the private or public sector. Economic debates are many times portrayed as a fight between economists who think that demand defficiency is the main cause of economic crisis and those who believe that what really matters is the supply side. In the current crisis we had the camp that saw the crisis as mainly a cyclical phenomenon and advocated for policies to increase demand and those who saw it as an outcome of excessive spending, whose effects could only be addressed by structural policies that improve the productive capabilities of a country. Portraying economists as falling in each of these two camps is an oversimplification. Most economists in the profession recognize the important of structural reforms and improving the supply side of an economy. In fact, all economists I can think of when they write or teach about growth in the long term they talk about how a country can improve its productivity, effort, capital stock, all of them variables that are associated to the supply side of an economy (the assumption is that demand adjusts at the same time as production feeds into income and then expenditures). What I find interesting is that the consensus that supply (incentives, productivity, innovation) drives output and welfare in the long run is then used in the political debate to push the argument that small governments and low taxes are the only sensible economic policy (at any point in time). And any argument in favor of higher taxes or a stronger roles for governments is dismissed on the grounds that it will create massive distortions and low growth. "Supply-side economics emphasizes economic growth.."
"...achieved by tax and fiscal policy that creates incentives to produce goods and services." In particular, supply-side economics has focused primarily on lowering marginal tax rates with the purpose of increasing the after-tax rate of return from work and investment, which result in increases in supply. The broader supply-side policy mix points to the importance of sound money; free trade; less regulation; low, flat-rate taxes; and spending restraint, as the keys to real economic growth. These ideas are grounded in a classical economic analysis that understands that people adjust their behavior when the incentives change. Accordingly, the lower the regulatory and trade barriers, and the lower and flatter the tax rate, the greater the incentive to produce." Why the focus on tax and fiscal policy or marginal tax rates or restrained spending? What about other institutions, rules, incentives that can affect growth? What is surprising is that the academic literature that has explored the determinants of economic growth finds limited support for many of these variables as key determinants of differences in growth rates across countries. Other things such as investment, education or innovation matter much more. And while one can argue that these variables themselves could be ultimately driven by taxes, the evidence is once again very weak on inexistent. The point is not that taxes do not matter when it comes to economic growth but that the oversimplification that makes supply side = small governments and low taxes seems to miss many of the variables that the academic literature identifies as determinants of growth, some of which could require a larger and not a smaller role for governments and regulation. The defeat of the Euro bond vigilantes? Paul Krugman has written many blog posts downplaying the fears of a sudden increase in US government bond interest rates (what he calls the invisible bond vigilantes). 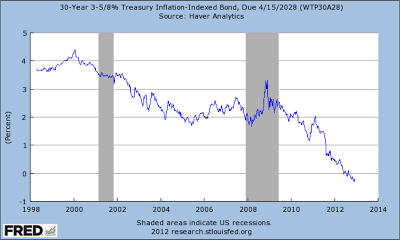 Despite continuous warnings by some market commentators about the risk of high inflation and the possibility that investors start dumping US government bonds, interest rates on these bonds have gone in the opposite direction and are now lower than when some of these fears were first expressed. In Europe the evolution of interest rates for governments bonds has been very different with several countries seeing very high levels and in some cases no access to funding. The fear was due to probability of default and potentially an exit from the Euro area, not so much inflation. But after a volatile period and following the statement of Mario Draghi supporting the Euro (no action yet) and the more recent agreement for funding for Greece and Spain, interest rates are coming back to levels which are not far from the historical average during the Euro period (and significantly lower than what these countries faced before joining the Euro). Below are 10-year government bond rates for Spain and Italy. Rates remain higher than the low values of 2006 but they are at levels which are not far from what we had seen in the early years of the Euro. Of course, this does not mean that the level of confidence is the same as those years, for that we want to measure the premium relative to German bonds, where we will see higher levels. But, at the same time, what matters for sustainability of government debt is the interest rate that a government pays and not its relative value relative to other countries. There is still plenty of uncertainty in both of these countries and I am almost sure we are not done with swings in confidence and some negative surprises but it is good to see that, at least measured by these rates, there is a growing sense of stability in financial markets. The debate in the US about how to deal with the "fiscal cliff" has produced a counterproposal by the Republicans on how to avert a crisis. The proposal is criticized by many because of its lack of details (see here, here, here and here). The way the proposal avoids dealing with the real issues and suggests solutions that do not impose a cost on anyone reminds me of some of the debates in Europe about finding a plan to deal with Greek government debt or the capitalization of Spanish banks. In all these cases you hear proposals that seem to generate resources without anyone having to pay for them. Republicans in the US want to raise revenues without increasing tax rates, cutting spending without really cutting it. And the Spanish government will bailout banks without imposing any cost on tax payers. In some cases these proposal have no logic in others there is some logic but a lot of wishful thinking that generates economic miracles. The first tradeoff is an intertemporal one. The government needs to produce budgetary plans that are sustainable, which given current conditions means to find additional resources. But trying to find resources too fast (cutting spending and increasing taxes over a short period of time) will have a negative effect on growth and might make the adjustment more difficult. This is the problem faced by the US economy over the coming months. Some want to create the impression that the problem is one of exploding deficits but this is not the "real cliff", the issue is the automatic cuts in spending and increases in taxes that will happen without any policy change. So when a plan claims to have found a solution by producing a $2 Trillion reduction in the deficit, it is not addressing the real issue. 1. We can find a way to dramatically improve the efficiency of the government and, as a result, generate a large amount of resources. Interesting idea but there needs to be a realistic plan that is based on feasible improvements in efficiency and not jus wishful thinking. 2. No need to raise tax rates, we just need to close loopholes. This arguments tends to work because we all assume that it is only others who benefit from the loopholes. It would be better to identify who is going to pay for this rather than talking about loopholes. 3. We do not need to raise tax rates, we will cut spending. This goes well with the argument of efficiency, especially among those with strong priors that governments do not produce any value. But when we start talking about cutting items like pensions or healthcare, we either admit that we are happy getting fewer of those services or we will simply have to pay for them ourselves. So there is no real gain here you still need to pay for healthcare, not with taxes but with an increase in your insurance premiums (unless you make, once again, the efficiency argument). A real plan needs to include first a statement on what are the services that we want the government to provide with an understanding that reductions in those services can have real consequences on individuals welfare. And then we need clarity on who is going to pay for these services. Here we cannot anchor the debate on the status quo (as I argued in my previous post), but it has to be a broad society decision on what we consider to be a fair distribution of the bill across different population groups. The New York Times presents a comparison of average tax rates since 1980 to make the argument that most taxpayers in the US face lower taxes today that back in 1980. Greg Mankiw does not like the fact that they link the year 1980 to Ronald Reagan's policies as instead he picks the end of Ronald Reagan's second term. It is important to look at the evidence on how tax rates have changed but what should be the benchmark here? Should we be alarmed if were to find that tax rates have gone up in the last decades? Should we be pleased that tax rates have gone down? Governments need to raise revenues in a way which is consistent with their levels of expenditures. Their level of expenditures is determined by political choices (demands for services that are provided by governments) combined with the efficiency that governments have at providing those services. It is impossible to make a general argument about the need for governments to become smaller or larger over time unless one is willing to provide the details on what are the services that should or should not be provided by the government or what are the efficiency gains that could be achieved. It is only after those arguments are presented that one can talk about whether tax rates should be flat, increasing or decreasing. One thing we know is that some of the services that we ask governments to provide, are becoming more expensive over time. In particular, if we look at health care we all are interested in buying more of these services and when we buy them, their cost is growing faster than inflation. 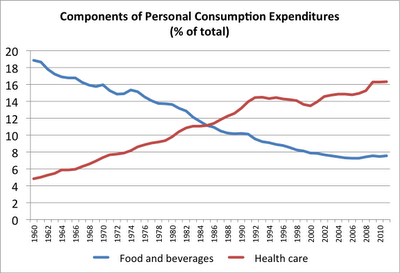 As a result, when we look at health care expenditures as a % of GDP, they keep increasing. And this has nothing to do with governments. 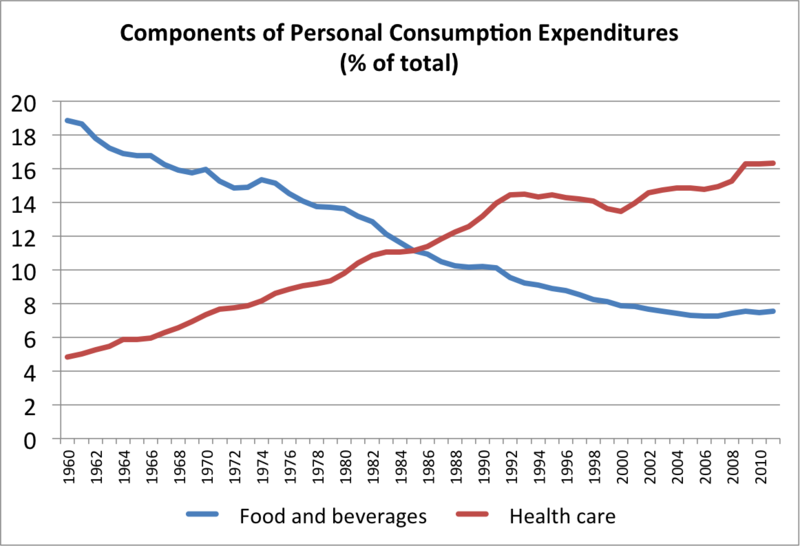 I produced the chart below in an earlier post that shows how the share of health care expenditures in private consumption has increased dramatically over the last decades (US data). Given the above trend and given that healthcare expenditures represents a large share of total government expenditures in advanced economies, it should have not been a surprise to see that governments are becoming larger and that, as a result, tax rates are going up. That is the benchmark against which we need to compare the data, not one with a constant tax rate.